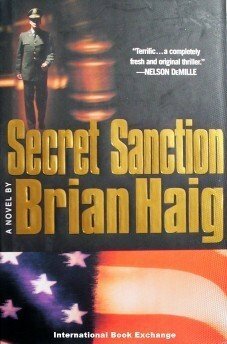 Secret Sanction by Brian Haig ( 2001, Hardcover VG/G )Book ConditionFrom the Inside FlapHardcover is in very good condition. The DJ has modest shelfwear to the edges and covers. The pages are tight and clean. The DJ is not clipped. 405 pages. BOOK/DJ: Very Good/ GoodFORMAT: Hardcover with DJISBN: 0446527432SKU: 0310110112Attorney Major Sean Drummond, along with a beautiful defense attorney and a stern prosecutor, must discover the truth about the deaths of a battalion of Serbs in Kosovo at the hands of the Green Berets. As the investigation progresses, Drummond is faced with the possibility that there is a cover-up, leading all the way to the White House.Visit my eCRATER Store for other great books and save on shipping! FREE DOMESTIC SHIPPING on orders over $25 when you buy other eligible items!All prices are in US dollars We use actual photos when possible We receive books from many sources and cannot guarantee against pet, perfume, or smoke smells. If this is a concern please email and we will be glad to check. The information provided by MUZE is not always correct. If there are any differences, our input is the correct information. DOMESTIC SHIPPING: Most shipping is by Media mail with delivery confirmation. Discounts available for multiple books that are paid for in one transaction. Priority and Express mail available. INTERNATIONAL SHIPPING: International buyers need to contact me for final costs before making payment. Buyer is responsible for all customs and duties. International shipments may take several weeks for transit and customs.Pay me securely with any major credit card through PayPal! Once Upon a Time by Brand, Irene B. et al.